SCERT Odisha Published Admission Notification of D.El.Ed., Diploma in Art Education (Visual), B.Ed., B.H.Ed., M.Ed. and M.Phil (Education) Courses for the session, 2019-2020 / 2021. Last Date for Submitting Online Application is 24 April 2019. Candidates Can Apply through Official Website. Online Admit Card will Publish On Official Website. Candidates Need to Fill Application Online. Admit Card Downloading Link will be Start Few Days Before Exam. Keep Checking this Site we Will Update when it Available. 01. Candidates Can Download their Admit Card from Official Website. 02. 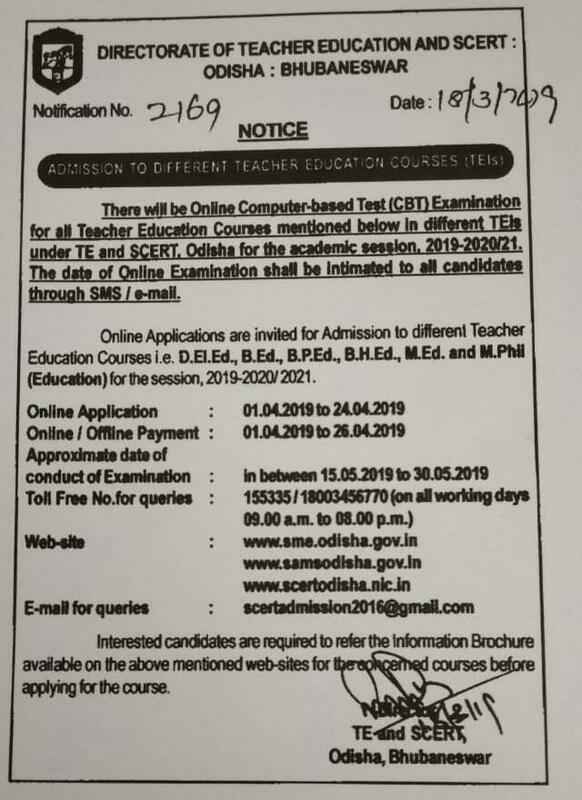 Candidates Need to Visit SCERT Website. After that Candidates Need to Click On Admit Card. 03. After entering On Admit Card Page On Details Box. Candidates Need to Enter their Registration No & Dob then They Can Download their Admit Card. Remember No Admit Card Will issue By Post. Candidates have to download it from Official Website.